What’s in a hat? — FEZ review. FEZ is a story about a 2D man-thing named Gomez who is sent on an amazing adventure into a dimension that the rest of his village simply doesn’t believe exists. Shortly after waking up one morning, a fez which allows him to see into the third dimension is entrusted to him by a cubic god-thing. The game then allows you to explore a two-dimensional world by shifting your perspective of the levels around a third dimensional axis. It’s really hard to say anything else about the plot without spoiling what the game has going for it, so I’m going to dive right into what FEZ got right. FEZ has a lot of good things going for it but none stand out quite so much as the amount of craftsmanship and focus that went into the game world. The world of FEZ is impressively large and sprawls out far and wide across a series of floating islands. The sheer scope of the game seems unmanageable at first, but near the end of the main quest I found myself scraping the corners of the world for a puzzle I could actually solve. Each location is lovingly crafted in terms of visuals and gameplay, but as soon as the game establishes a pattern it will add something new like a different type of platform, or a new concept to grapple with in three dimensions. Though the game requires a fair bit of retracing your steps, the monotony one might expect from this mechanic is broken up by a day and night cycle. You probably won’t mind revisiting a location at night, dusk, or dawn because it changes the whole feel of the level. In a few cases I wasn’t sure if I’d actually been to a location before, but there’s a map system with a very handy feature that tells you if you’ve found all of the secrets in a location; this way you can be certain that you’re not spending hours on a treasure hunt at a beach with no treasure. Thanks to a decent teleport system, a secondary not-as-predictable teleport system, and the ability to respawn at the last solid ground, FEZ encourages you to experiment and explore the world it presents you with. Above all, there’s an element of emergent plot that tells a fantastic story by simply exploring the game world. Discovering what happens in FEZ is part of what makes the experience so amazing so I’ll leave the specifics out for those who have yet to experience them. The soundtrack was arranged by a talented man who goes by the name Disasterpeace. He is in his own right worth checking out; in fact Rise of the Obsidian Interstellar is one of my favorite chiptune albums. If you’re also a fan of the genre or just know a good soundtrack when you hear one, you’ll probably want the soundtrack to FEZ or the remix album titled “FZ: Side F” because Disasterpeace does an amazing job of scoring the game. To try and put it concretely I would say it’s nostalgic, atmospheric, and wonderfully complements the pixellated beauty of the game itself. There’s even a “low pass filter” effect that kicks in when you go behind something in-game just to make the music that much more a part of the gameplay experience, and little ambient effects that make you go “wow” are all throughout the game. My only complaint is that some of the sound effects and fanfares are noticeably louder or clash with the music that’s currently playing, but it’s a very small imperfection in a very strong aspect of the game. Interestingly, FEZ’s length depends on your level of commitment to it. I beat the game in about three hours and that’s while stopping to smell the roses from time to time. Beating the game, however, only requires you to solve half the puzzles. The other half of the puzzles will probably take you 6-8+ hours to solve and find them all on your own, and that’s a decent length for an indie platformer. Those who want the game to go on longer, or who just want to experience more of Fez’s strange and beautiful world, can always take another pass with the new game plus mode. Unfortunately, for all of its atmosphere, vibrant worlds, and deep enigmatic mythos, FEZ has some problems. The most damning issue I encountered is that FEZ, on PC, crashes incredibly frequently. I don’t think I was able to play the game for longer than thirty minutes at a time without the game freezing and exiting on me. The game autosaves very frequently so I rarely lost any progress, but it really breaks the flow of a game that relies so heavily on atmosphere. It was especially bad during some of the box puzzles and “dark cube” rooms which I have yet to solve because I can’t find the answer before the game freezes. Another thing I noticed is that there’s a bit of inconsistency with the leaping controls when it comes to jumping and switching viewpoints at the same time. This isn’t a major problem since the penalty for dying isn’t much more than a slap on the wrist, but it can be frustrating at times to turn all the way around a 180 degree corner without trapping yourself behind the scenery and falling to your doom. It encourages thought in your actions, but when it’s during a timed leaping puzzle then a missed jump can mean starting over much farther down. While we’re on the subject of controls: if you prefer to use a keyboard then there’s only a few preset control schemes to choose from, and full button reassignment is only possible on a controller. This may also bother some people: the game is basically an item collection quest. It’s a very pretty, very entertaining, wonderfully thought out item collection quest, but for some gamers this can be an immense turn-off. If you’re looking for something atmospheric, puzzling, but hard as nails and about boss fights and monster slaying then I suggest you try the remake of La Mulana. I’ll wait right here while you do. Did you try? Well, stop crying and we’ll play a game that doesn’t hate you for a while… here, play FEZ. 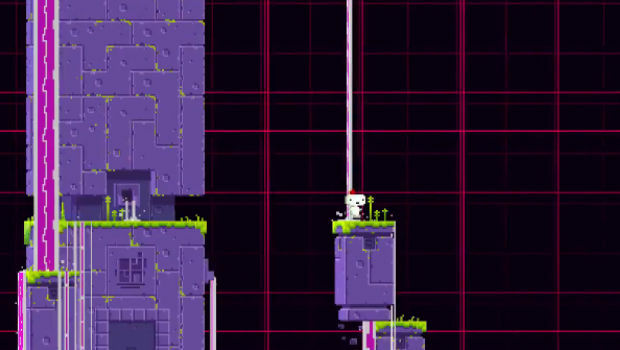 For $10, FEZ is one of the most solid “must-buy” titles in the indie game scene. It’s a euphoric example of how solid art direction and a good musical score can make a game feel like something more than it is. If you’re an indie game fan who enjoyed playing Knytt, you’re going to love FEZ. Once you solve everything, you might want to see the world again from time to time but there’s no real reason to play all the way through again except to show it off to a friend. For all the freezing and stability problems that FEZ has on the PC, it’s likely that they will be fixed in an update at some point so I’ve adjusted the final score a bit to reflect that its biggest flaw may be gone someday. Even with all the crashing issues though, I didn’t step away from the game even once until I saw the credits roll; it’s that gripping of an experience.